The Power of Relentless - Audiobook | Listen Instantly! Harness the Secret Principles of RELENTLESS! Are you ready to supercharge your career…grow your business beyond your wildest dreams…turn your life up to eleven? Learn the secrets of success from "Mr. Relentless" himself. 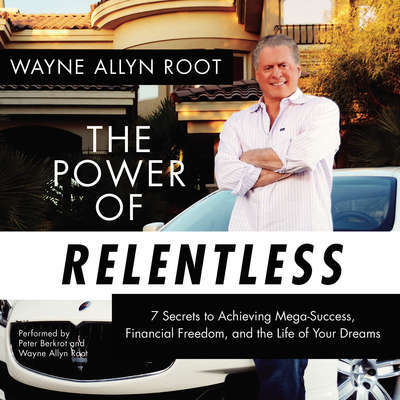 Capitalist evangelist Wayne Allyn Root—bestselling author, reality TV producer, serial entrepreneur, former vice presidential nominee, and business speaker on the international circuit—reveals the seven principles of relentless that will take you to a level you never imagined. Wayne Allyn Root is a talk show host, bestselling author, business speaker, and television and radio commentator on the topics of business, economics, entrepreneurship, and politics. He is a regular guest on Fox News, as well as hundreds of national and local radio shows across the United States, with over one thousand media appearances annually. Root is a former presidential candidate, the 2008 Libertarian vice presidential nominee, and a favorite Tea Party speaker.